Introduction: Born in a political dynasty, Rahul Gandhi, is the son of Congress president Sonia Gandhi and late Prime Minister Rajiv Gandhi. He is currently a Member of Parliament from the Amethi constituency in Uttar Pradesh. Under the current political scenario in India many Indians look up to Rahul as a future Prime Minister of India including a majority of congress workers. In the light of this, Ganesha foresees the future of this young budding politician. Guru, the Lord of his seventh house of public image and the Lord of his tenth house of power and authority, will be debilitated in the eighth house of evil and form Chandaal Yoga as it will be in conjunction with transiting Rahu. This prompts Ganesha to think and believe that his image may take a beating in 2009. He should be very careful in his speech as Guru will be aspecting the second house of speech and transiting Ketu in the second house of speech will prompt him to have a bitter speech as well as words that can create misunderstandings. 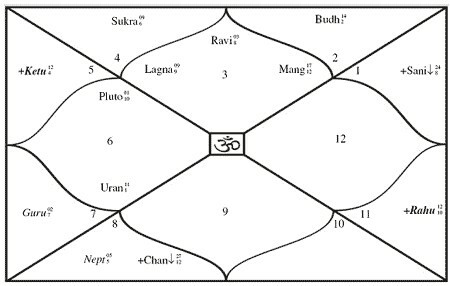 He may still be lucky as Shani, the Lord of the ninth house of bhagya and luck, though will be in conjunction with natal Ketu, will aspect the ninth house, its own house, fortifying it. This may in some way help him avoid controversy and negative publicity but this planetary conjunction will not favour him throughout the year 2009. He will be passing through Rahu Antardasha in Moon Mahadasha throughout the year 2009. This period will not favour Rahul Gandhi as Rahu and Chandra are natural enemies. There may be occasions of defamity, mental agony and pain due to enemies. He may gain from South­West direction in the form of support from the politicians. If he does a lot of publicity for the general elections in the South West states like Maharashtra and Karnataka, then he may get good votes for Congress. Mid August to Mid November 2009, there may be mourning like situation in his family. If he goes on a religious pilgrimage and offers prayers to Shani and donates money or ghee every Thursday and offers Abhishek to Lord Shiva, then he may be able to reduce the malefic influences considerably.